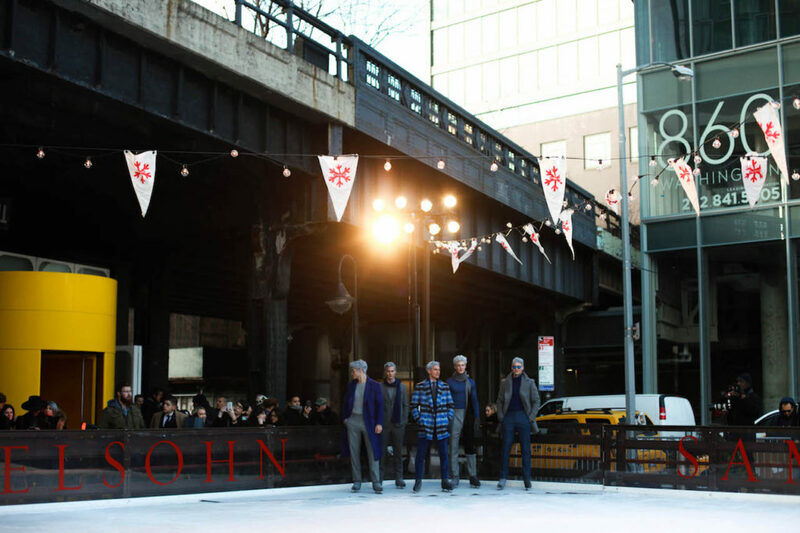 Beneath the commanding glass-and-concrete facade of The Standard High Line hotel, the ice rink usually reserved for cold weather fun was adopted for an altogether different purpose. 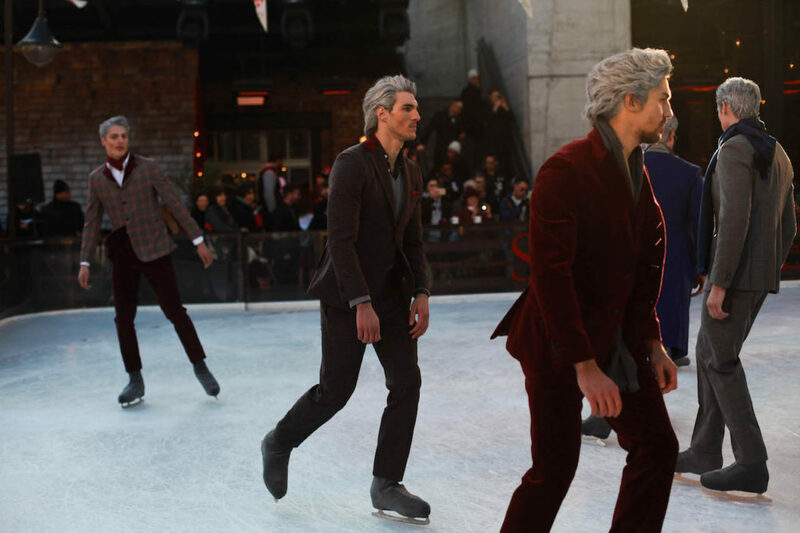 Nearly two dozen models stood in formation gliding over the frozen surface scratched from use while sporting Samuelsohn’s fall collection. Despite the 38-degree temperatures (which felt even colder given the winds whipping inland from over the Hudson) none looked the least bit phased by the bout of late-winter chill. It was perplexing until I recalled a fundamental element of the brand’s ethos that would prove to come into play later on: designed to perform. Founded in 1923 in Canada by Lesser Samuelsohn upon his emigration from New York, the finest tailoring details and quality have acted as cornerstones of the brand. 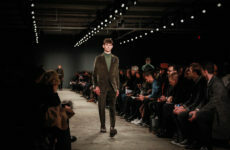 It has enjoyed a quiet expansion, only opening a New York showroom in 2011, which afforded them a noticeable if somewhat under-the-radar presence when it comes to the burgeoning menswear market. What sets them apart most is the commitment to function. 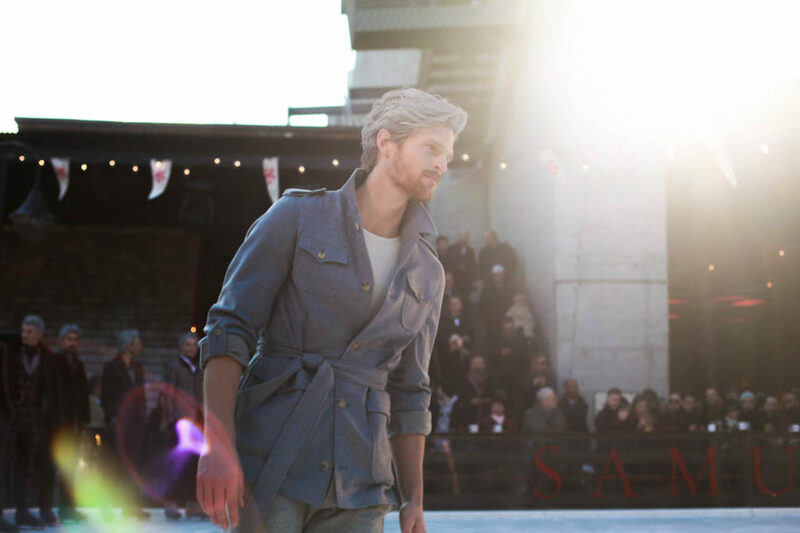 Samuelsohn has invested heavily in developing luxurious fabrics that have unexpected properties like their signature ice wool, a material that maintains optimum body temperature and can repel water. So back to those models and their apparent indifference to the rapid dip in the forecast. They were no doubt clad in these modern materials by way of plaid sport coats, slim flat-front trousers and sharp coats with fur collars. The colors were muted, most variants of gray and frosty blue with shots of burgundy and oxblood. It made for a subdued contrast that was tasteful if not revolutionary. The real story was in the tailoring. The garments on display didn’t make the all too common mistake of confusing fit for tightness. 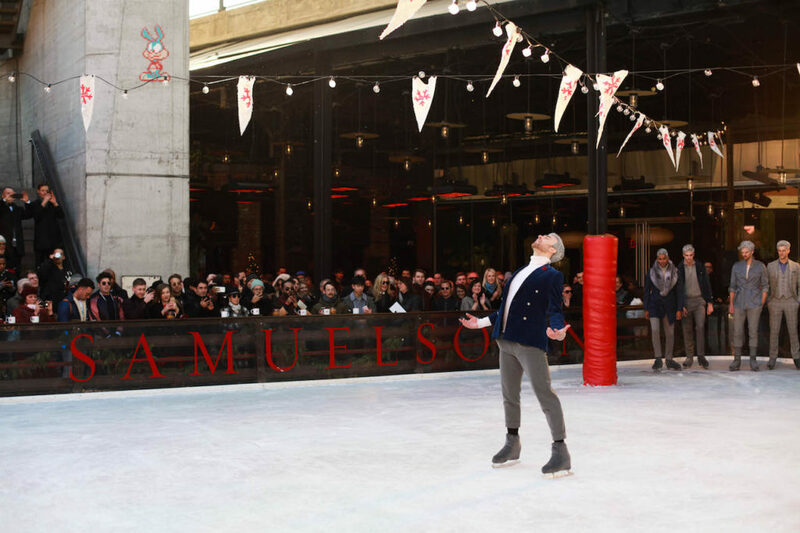 Every one of the men involved seemed comfortable and unrestricted, particularly Olympic silver medalist Eric Radford who put on a skating cadenza of sorts showing off his skills while demonstrating just how fluid Samuelsohn’s wares can be. 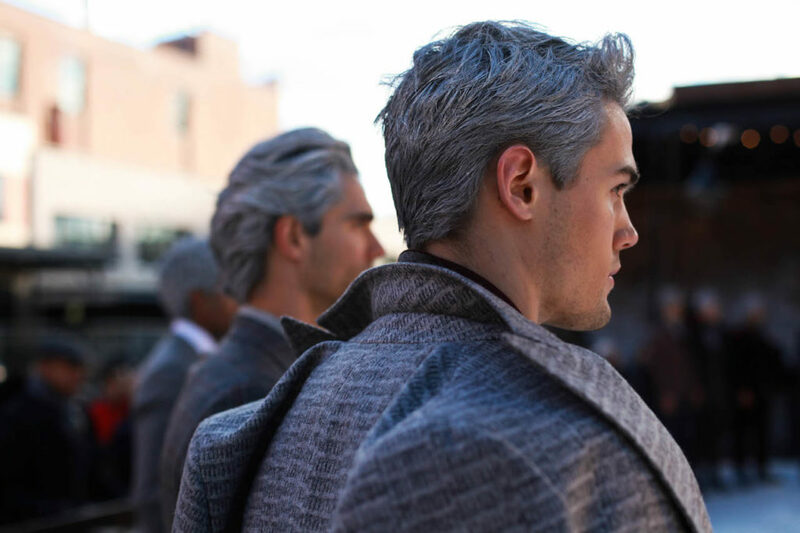 All of the men in the unique presentation had a pared down, clean look offset by a shock of silver hair, which intensified the arctic inspiration and had an ennobling effect on the youthful lot. “There are a lot of firsts here. 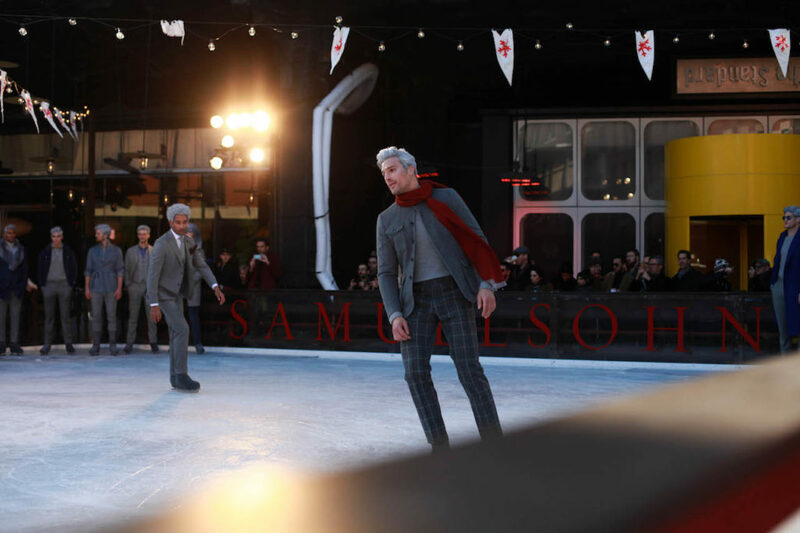 It’s the first show during New York Fashion Week for Samuelsohn, we’re unveiling our new branding with its wine and silver coloring and we’re showing our Ice wools and cashmeres,” Arnold Brant Silverstone, the president and chief creative officer told WWD. Making menswear feel fresh and allowing it room to breathe is a challenge that isn’t getting easier as the proliferation of labels continues in the luxury sector. 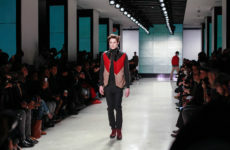 This collection offered loads of approachable, distinguished pieces and Samuelsohn will continue to gain steam as long as it makes the same commitment to innovation in its cuts as its fabrics. Its clothes have the movement necessary to advance in this market, it just needs to bring in a sense of lightness to break wide open.